The safest drying towel out there! 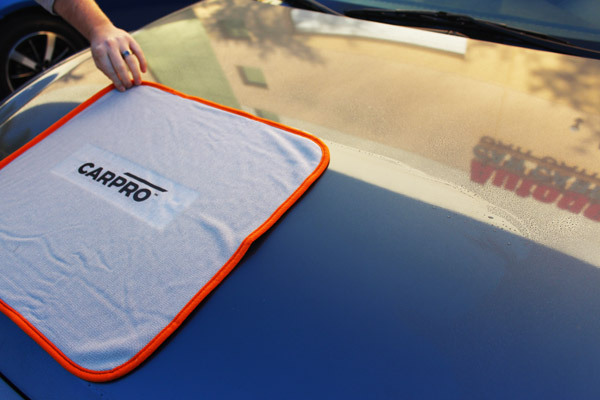 The CarPro Dhydrate Drying Towel will revolutionize your entire car drying process! The ease with which the CarPro Dhydrate Drying Towel can engulf every drop of water on your vehicle will leave you so amazed you may need it to dry the drool off your chin! The CarPro Dhydrate Drying Towel was designed to create as little drag as possible to avoid washing swirls and scratches while you are drying. The CarPro Dhydrate Drying Towel will glide effortlessly across the surface of any paint, treated or untreated, coated or uncoated. All without damaging the existing protection that is on your car already. Due to the extreme absorbency of the CarPro Dhydrate Drying Towel, drying your paint off could not be any easier. Simply lay the CarPro Dhydrate Drying Towel across the surface you are drying and slowly drag it across. That’s it, you are now ready to move on to the next surface without worrying about any water being left behind to evaporate and cause water spots. Perfect for use with the “blotting method”, the CarPro Dhydrate Drying Towel quickly removes water from your vehicle’s surface! If it isn’t enough that the CarPro Dhydrate Drying Towel is made with materials that will greatly reduce the risk of scratches and swirls, the light grey color of the CarPro Dhydrate Drying Towel makes it incredibly easy to spot any dirt or debris that may gather in it fibers. This means that it would be nearly impossible for you to accidently drag a debris-riddled towel across your perfect detailed paint! If that still isn’t enough for you to feel confident in your paint’s safety while using the CarPro Dhydrate Drying Towel, this towel has even more scratch reducing properties! The CarPro Dhydrate Drying Towel is made with an edge made of microfiber, not piping. This means that the edges won’t cause any scratches during use. Combine that with the fact that it tagless and you would be hard-pressed to find something on this towel that is capable of scratching your precious paint. The CarPro Dhydrate Drying Towel is durably made and is designed to be completely lint free. Making it extremely easy to clean and ready for use after use without wear!